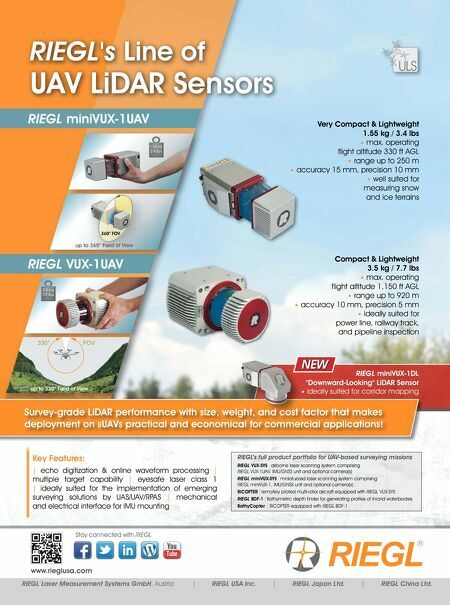 8 October/November 2018 unmanned systems inside W hich method will get commercial drones f lying first? Waiting for the federal government to evolve workable drone rules or devolving federal authority to the states to see if the states can move faster? The thought struck me as I was talking with Kansas and Oklahoma state legisla- tors at the Oklahoma-Kansas UAS (un- manned aircraft system) Tech Forum in September. I had just given my speech and I had encouraged state, local and tribal authorities to take a greater role in drone rulemaking because I think they can move faster than the federal govern- ment. These gentlemen had clearly been thinking about how to make their states more drone-friendly, but the thought that they could move faster than the feds in rulemaking was something they hadn't considered. One legislator explained: "We've always been told the FAA (Federal Aviation Administration) has primacy over states for aviation and locals don't have a role in drone regulation—it's a fed- eral responsibility and that's it. End of discussion." MUST IT BE FAA? Well, should drone regulation be com- pletely a federal responsibility? Should we treat low-altitude drone f light more like cars than airliners? More important- ly, can state governments get to commer- cially viable drone regulations faster than the feds? The FA A correctly asserts its primacy in aviation regulation over states—an authority that goes back to the 1926 Air Commerce Act that gave the federal gov- ernment the overarching responsibility to issue air traffic rules, license pilots, certify aircraft, establish airways, and operate air navigation aids. At the time, aircraft advocates believed the feds need- ed primacy to ensure aircraft f lying be- WHAT'S NEEDED? Four states are particularly well positioned to develop and test initial drone rules. General Overview by James Poss, Maj Gen (Ret.) USAF ALASKA Has the programs and experience plus deep pockets and an aviation-friendly populace. KANSAS Has the programs, experience and a very large aerospace manufacturing presence. MISSISSIPPI Has the programs, the headquarters of the ASSURE research team and a drone training center. NORTH DAKOTA Has the programs, a deep bench of expertise, the political will and the necessary funding. by JAMES POSS, MAJ GEN (RET.) 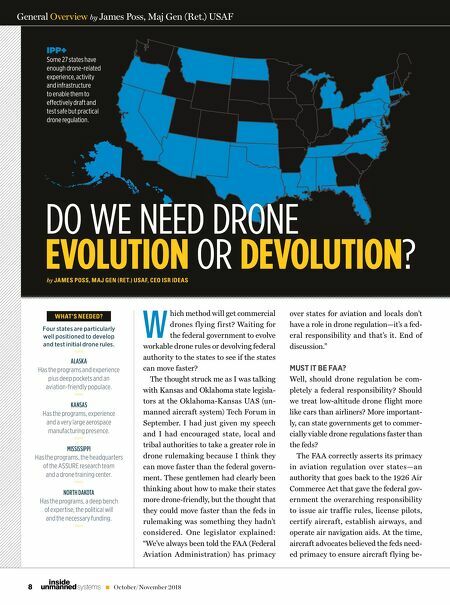 USAF, CEO ISR IDEAS DO WE NEED DRONE EVOLUTION OR DEVOLUTION? IPP+ Some 27 states have enough drone-related experience, activity and infrastructure to enable them to e•ectively draft and test safe but practical drone regulation.